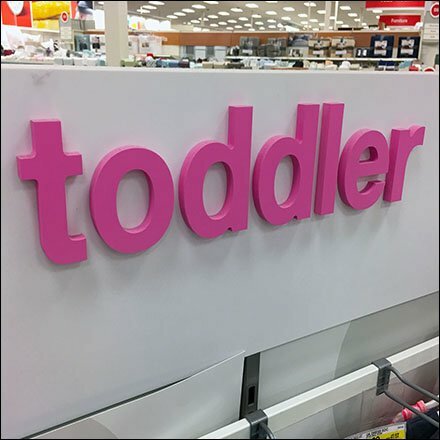 If Pink is the color and brand for girls and grown women, then why not Pink Branded Winter Toddler Department for females of a younger persuasion? Of course “pink” intrudes ever so slightly on “Pink” branding. Still, 3D silhouetted lettering in a hot color gets the point across communicating the “what” and “who” of the display. See the Pink Branded Winter Toddler Department inset photo for fleecy closeup of the cold weather offering.